Thanks to this tweet from Fast Company, I dove head first into a rabbit hole today. By the time I came back up for air a couple hours later, I had ordered a (1) CD that isn’t a CD, (2) five stepper motor/controller sets, and (3) 20 empty plastic spools from China. Why did I dive in you say? 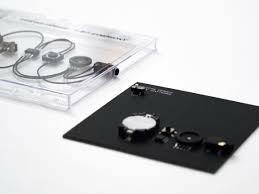 Because I was inspired by the simplicity and elegance of Tristan Perich’s 1-bit audio, especially the presentation of this “music” in physical component format. Do I think I will enjoy the music? No, absolutely not, it will probably be one listen noise. But the “CD” will hold a special place in my collection of shiny things because of what it is. I fell deeper into the hole when I watched videos on the mictrotonal wall and drawing machine. Wow. Just wow. The wall is stunning. While the video hits home with the pitch changes as the camera pans down the wall, I am sure it was much better in person. It was the computer physically generated art that had me hooked. I have long had a love for this type of thing after learning about the Cybernetic Serendipity exhibition many years ago, then reading the very hard to read, very academic book “When the Machine Made Art: The Troubled History of Computer Art” by Grant D Taylor. It is on the topic of Tristan’s drawing machine that I spent most of my time exploring while in the hole. How did Tristan make the drawing machine? How can I make one? What would the output be with differences in code or construction? When is the right time to stop the random walk that is creating the art? Is the creation as big of a part of the art as the final output? I found my way out after researching step motors (the kind used to make plotters and 3D printers) and how to program them with the Raspberry Pi. I found how I might create my own drawing machine, and quickly ordered the parts thanks to eBay’s bottomless pit of cheap parts. Stat tuned for an update on that project when I get around to it.